Jimmy D. Lane's first album for APO, Long Gone, has been instrumental in gathering widespread acclaim for the multitalented son of the late blues legend Jimmy Rogers. Critics worldwide have responded positively to Lane's incendiary guitar prowess and powerful vocals. Comparisons to Hendrix have been made. 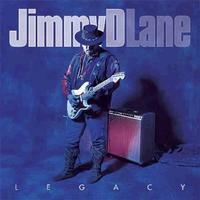 With Legacy, Jimmy D. Lane proves that he is as compelling looking back towards the great blues masters of the past as he is at crossing stylistic lines and pushing the music forward. His nine original compositions, while firmly rooted in the blues, allow Jimmy plenty of room to showcase his vision of a blues future. Jimmy D. is joined by the great Carey Bell on harmonica, Ronnie Earl alumni Per Hanson on drums, David Krull on piano and Freddie Crawford on bass. On the rousing remake of Howlin' Wolf's Big House, Wolf cohorts Hubert Sumlin and Sam Lay join in on the fun.